In stock -This product will ship today if ordered within the next 11 hours and 59 minutes. Sensitive scalps need gentle yet effective care and a purely natural shampoo that cleanses without chemicals and toxins that can irritate the scalp. Gently cleanse sensitive scalps with this mild, pH balanced, hypoallergenic and fragrance free shampoo, to leave hair and scalp feeling, refreshed, moisturised and comforted - without causing irritation. Massage into wet hair, adding more water to build a natural lather, Rinse & reapply if necessary. 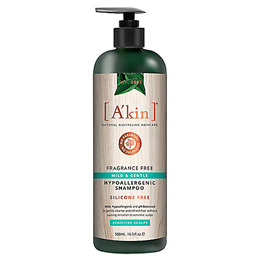 Below are reviews of A kin Mild & Gentle Fragrance Free Shampoo - 500ml by bodykind customers. If you have tried this product we'd love to hear what you think so please leave a review. Very good didn't irritate, just left my hair a bit frizzy, but ok otherwise. My daughter suffers with flare ups of Psoriasis on the back of her head, this shampoo along with the conditioner is very gentle and works well without aggravating her condition.